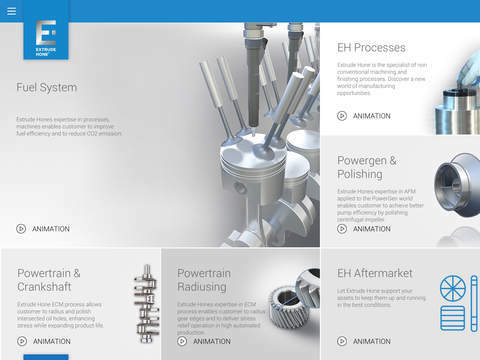 Extrude Hone Solutions Mobile App Now Available. Extrude Hone is extremely excited to announce the release of our new EXTRUDE HONE SOLUTIONS mobile application at Apple’s App Store. This week, tens of thousands of metalworkers, production managers, and manufacturers from around the world are converging on Düsseldorf, Germany, to kick off METAV 2016, the 19th International Exhibition for Metalworking Technologies, February 23–27. There, they will explore the largest collection and widest range of manufacturing and metalworking technologies ever presented one place, covering aerospace industries, the automotive industry, machine and plant building, medical engineering, optics, power and environmental technologies, precision mechanics, and much more. Madison Industries Expands Industrial Solutions Portfolio Madison acquires Extrude Hone. Chicago , IL – On November 3rd, 2015 Madison Industries was pleased to announce that it has signed a definitive agreement with Kennametal Inc. (NYSE: KMT) to acquire seven businesses including Extrude Hone, Tricon, Landis, the Biel, Switzerland business of Kennametal Infrastructure and the Koblenz, Germany and Milan and Bellusco, Italy businesses of Kennametal Stellite. Closing has been completed December 1st, 2015.